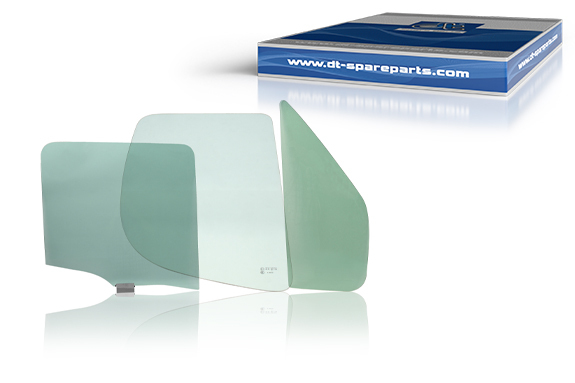 The brand DT Spare Parts offers vehicle windows in laminated and safety glass as well as door, side and rear windows. All glass windows feature a precision fi t for easy installation. Different tints restore the original look of the vehicle. All windows are provided with an ECE certifi cation mark. When glass is broken, it is necessary to fi nd quick and reliable replacement. For this reason, the door, side and rear windows of the brand DT Spare Parts are sent, if required, in individual packages secure for transport, which are also suitable for CEP shipping – in addition to classical bundling units. When replacing all windows, ensure that all possible glass fragments and glue residues have been completely removed. Also, avoid future rusts spots by taking care not to damage the paint when using the adhesive or during assembly. Already existing rust must be removed before installation, and repainted afterwards. When replacing the door window, apply lubricant to the guides to ensure the window slides optimally. Teflon spray is particularly good for this. During installation, ensure it does not become blocked in the guides when being raised or lowered; otherwise, it will need to be correctly aligned. Before reassembling the door panel, raise and lower the side window several times to guarantee that it opens and closes optimally and without great effort. Degrease the adhesive surface of the window frame and the window itself before installing a new side or rear window, so the adhesive can bind the components together optimally. The window must be placed under pressure for a certain amount of time after assembly, so that the adhesive can properly dry. In this regard, observe the instructions provided by the adhesive manufacturer.